After Russia interfered in the last US presidential election, Facebook introduced measures to prevent foreign actors from spreading misinformation and masquerading as American organisations. Overseas publishers have been caught in the crossfire. 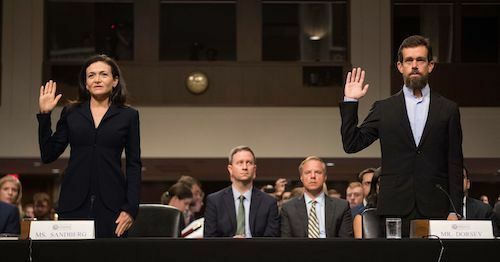 Facebook COO Sheryl Sandberg joined Twitter CEO Jack Dorsey and Google’s empty chair in front of the Senate Intelligence Committee this week, where she outlined the social network's new policies. These include hiring more moderators, culling fake accounts, making political advertising more transparent to users and collaborating with fact checkers to identify and remove false and misleading content from the platform. The company deserves credit for - belatedly - working to stamp out bad actors and fake news. But non-US publishers, including Convershaken, have been barred from advertising stories about politics or “issues of national importance” to US residents as a result, restricting their access to an audience of millions. The rules, introduced in May, aim to verify the identity of groups running adverts on Facebook and provide that information to users. However, no distinction is made between political organisations and journalistic outlets. Political commentators and news sites that enter the verification process are told, “You can only be authorised to run political ads in the country where you currently reside.” Try to promote an article about politics to US residents from abroad, and Facebook rejects it. Overzealous moderators also blocked stories about Avengers: Infinity War, the use of VAR at the World Cup and an article comparing Lululemon to Apple shortly after the new policy was introduced. Political journalists and commentators living abroad – some of whom are American citizens like myself - shouldn’t be prohibited from promoting their articles to US residents. Political journalism and fact-based opinion differ from political advertising, and legitimate political writers and broadcasters shouldn’t be lumped in with foreign agents spreading lies and masquerading as Americans. Facebook and Twitter’s stated goals include nurturing a diversity of opinions on their platforms; that should include views from outside America too. Facebook’s blanket ban makes it tougher for foreign publishers to build their brands and grow their audiences in the US, and harder for Americans to discover political and national content from overseas outlets. The social network is sacrificing ad dollars, missing out on valuable content for its platform, and wasting moderators’ time blocking fact-based, clearly sourced content and arguing with irate publishers. Facebook can resolve the issue by exempting journalistic content from its policy, verifying overseas publishers that are legitimate news outlets, and flagging promoted media to users if it was produced by foreign publishers to ensure transparency. Rectifying the problem might require some time and resources, but would pay off financially and bolster Facebook’s reputation for promoting high-quality content to its users.